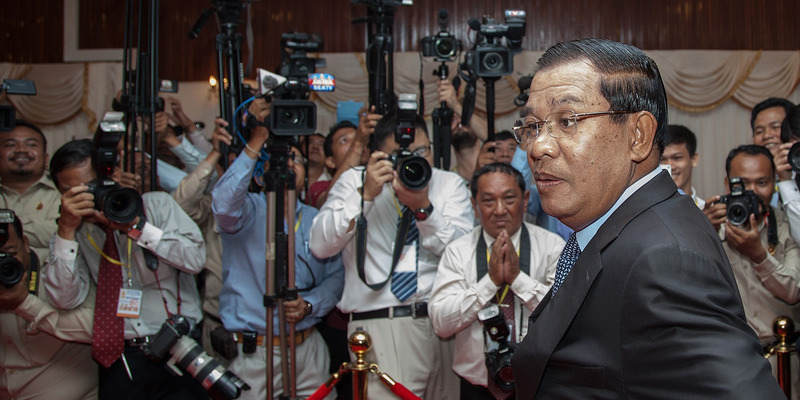 Omar Havana/Getty ImagesCambodian Prime Minister Hun Sen. The head of the Cambodian prime minister’s bodyguard unit has been sanctioned by the US Treasury Department. Under the Global Magnitsky Act, General Bun Hieng was targeted for human-rights abuses and will have any US assets frozen. The Magnisky Act was originally created to punish Russians involved in the torture and death of a lawyer, but has been expanded to target broader human rights and corruption issues. The Russian lawyer who attended the infamous Trump Tower meeting in 2016 brought a memo with her that focused on the Magnitsky Act. The head of Cambodian Prime Minister Hun Sen’s bodyguard unit has been sanctioned by the US Treasury Department. Using the Global Magnitsky Act, Hing Bun Hieng has been targeted for human rights abuses. Any assets in the US will be frozen and he won’t be able to engage in any transactions with individuals in the US. “General Bun Hieng commanded a Cambodian unit that engaged in a series of human rights abuses, and was personally implicated in attacks against a number of individuals, including a U.S. citizen,” Sigal Mandelker, Under Secretary of the Treasury for Terrorism and Financial Intelligence, said in a statement. The US Treasury highlighted one widely condemned incident in particular, which happened in 2015 in front of the National Assembly, where lawmakers Kong Saphea and Nhay Chamroeun were pulled from their cars and beaten. Nhay Chamroeun ended up with a broken nose, broken teeth, and broken cheekbone. “In the 2015 incident, only three members of the PMBU were sent to jail after they confessed to participating in an attack on opposition lawmakers, and were promoted upon their release,” the US Treasury said. Bun Hieng has become the the 59th individual or entity to be sanctioned under the Magnitsky Act, which was created in 2012. It was named for Sergei Magnitsky, a Russian tax lawyer who discovered a $US230 million tax-fraud scheme that implicated allies of Russian President Vladimir Putin and high-level Kremlin officials. It was found that Magnitsky was illegally detained for 358 days and tortured before his death, but the Kremlin insists he died of a heart attack. It was the Magnitsky Act that the infamous Trump Tower meeting was predicated on, as Moscow retaliated by banning the US adoption of Russian children. The law originally targeted those thought to be involved in Magnitsky’s death but has been expanded to target perpetrators of corruption and serious human rights abuse. US officials recently suggested that the US could use the law to take action against China for illegally imprisoning hundreds of thousands of Uighur men and women in the Xinjiang region.